The iPad version of World of Goo was released on December 16, 2010. It can be purchased from the App Store for $9.99. This page describes the changes between the desktop and iPad versions of the game. For further information about the iPad version, see the frequently asked questions. There is presumably a demo version that goes as far as Hanging Low. This is deduced by an additional signpost text SIGNPOST_HANGLOW_2 which reads "The Goo Balls had hoped their progress would be recorded!|But they knew that because of important World of Goo Corporation regulations...|...there was no SAVE feature in the DEMO version.|And that when the power turns off, everything will be lost.|...|-but the Sign Painter never forgets". There is a new EndOfDemo movie. A link is added, presumably to the title screen, called "get the full version". In order to see other players' towers in the World of Goo Corporation, the player needs the Apple Game Centre installed. This is not available until iPad iOS version 4.2. The number of balls in the Corporation is limited to 200. Tap and hold to use the whistle. Many particle effects have had their maxParticles value halved to improved performance. Some levels have had extra ambient particle effects removed. World of Goo Corporation is limited to 200 balls. In "text.xml" this string is defined as "what is it?". There seems to be no way to enable "profanity.xml". In the strings, "GooBall" has been consistently replaced with "Goo Ball". The credits have been updated to include the iOS programmers, and special thanks to DavidC and the GooFans. A complete text diff from 1.40 to iPad 1.0 is here. A new file "text.jp.xml" has been added; this is of the same format as text.xml but only contains English and Japanese (jp). Additionally, "resources.xml" has been extended. Whereas before a <font> had only attributes id and path, it now also has an attribute jp, the path to the Japanese font. While you can still have 3 profiles, you can't enter a name for them; they are all called Anonymous, unless you have Game Centre installed, they are all instead called by your Game Centre user name. Additionally, the currently selected profile now shows up in the title screen under the world. The pers2.dat file has no online player key but has two new fields for Game Centre data, documented here. The dragmarker and detachmarker images have been changed on all the balls; the word inv has been added. For example, instead of dragmarker_128_p1, there is now dragmarker_inv_128_p1. Could this mean invisible? Shine parts have been removed from some balls. ZBombMom now contains 37 ZBombs (down from 42). UndeletePills now contain only 2 Spam letters (down from 4). A particle effect named "zBombBurn" has been added, and is used in ZBomb to replace fireBallBurn. SuperFuseChallengeTime has been changed significantly. There seem to be fewer beauties on clouds, and the OCD has been reduced accordingly (was 32, now 18). ImmigrationNaturalizationUnit also has fewer balls and the OCD has been reduced to 51 balls (down from 61). Deliverance also has fewer balls. Music is stored in AAC format with a .aac file extension (MPEG ADTS, AAC, v2 LC, stereo, mostly 44.1kHz but one file is 48 kHz). Sounds (in both sounds/ and balls/) are stored in compressed AIFF format with a .aifc extension (IFF data, AIFF-C compressed audio). 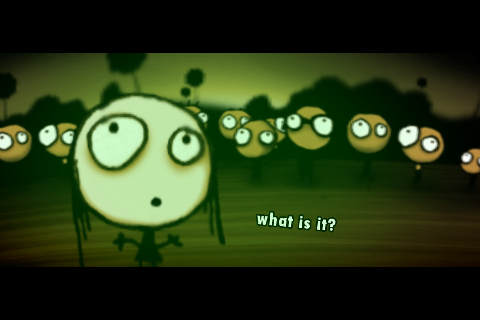 Movie and animation binltl formats are the same as other 32-bit platforms. You wrote version 1.40. Is there a new version of WoG? Is it possible to find this "upgrade" somewhere? 1.40 is the Linux version. "profanity.xml" isn't new: it was there in the Linux version also. Also in the Linux version was a second sign in WOGCorp. Any chance that is there in the iPad version? Which version of WoGCorp? If you mean the first one "WoGC", then the second sign is something about the limits to three hundred. I'm unaware of any signs after the Terminal and the first sign in any other WoGC's. Yeah, it might just be the first one. Didn't check in the others. You can always check in World Of Goo editor, but don't edit anything! It seems this area really is infinite! Of course, in iPad version, it is limited to 200. I don't have profanity.xml in my Linux version (1.40). I also can't see any way to activate profanity. what about version 1.41? It may have it. Can confirm there is profanity.bin in properties folder of Linux version. Its there because of that "WTF" easter egg difference between PC and other two ports. It is already activated, In the movie where world becomes 3D one of characters say WTF in Linux/Mac and on PC it says "what is that"
@AP: Whoa, totally didn't notice that was there before on all versions. I only saw it in Linux! I stand corrected. In iOS, the default is non-profane, and I don't know how to turn it on. Changes in level Mistys Long Bony Road, far fewer balls. Managed to get 29 with the technique that gives 42, I think, on PC. And balls properties have been changed, or level gravity... pipes can now easily hold 5 common goos + 1 bone goo. On the PC version I don't think 1 bone+3 common can be supported by the pipe. And there seams to me few "bugs". First, in all levels, if you touch the screen before letter edges disappear the whistle will stay on even if you are not touching the display. I just noticed something, whistle can't be used in Graceful Failure, in every version of the game! Why is that? The whistle isn't really required in Graceful Failure, but to the actual purpose of the ban is beyond me. I can explain the extra sign. 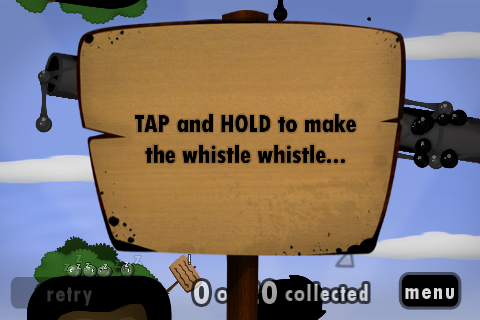 I don't know about the computer/iOS versions, but the Wii demo has that sign sticking out of HangLow's pipe. My son finished the last level in the game, and now can't play again. There are no longer active links. He'd like to start again, and play perhaps as a new or different user. Why are we locked out? It looks to me like everyone loves this game (we were impressed). But it was all over too fast, and we can't even start over again. Is there something; we missed? did wrong? can do to start playing again? for free? We paid for the game this week, and totally expected to have it on the iPad for more than 2 days. I'm not a hacker, not a whiz, just a new customer. I'm not completely certain what would cause that kind of problem. You are supposed to be able to play the game infinitely. Sounds like a problem with Apple. What exactly do you mean that there aren't active links? Can you not find World of Goo in your app list anymore? Or can you launch the game, but not play any of the levels again? @MOM: I think he can load the app but he can't get past the main world screen since he finished the game. I still suggest you contact 2DBOY or AppleSupport directly. But hey, contacting both may double your chances. Good luck. It's just more guaranteed that they'll get help if we try to debug the problem here directly. But I'm a pessimist. Idea: back up your profile, then reinstall. I had a similar problem in Fish Tycoon and Angry Birds. This fix solved both. I can't purchase the demo version is that because I already have the full version?